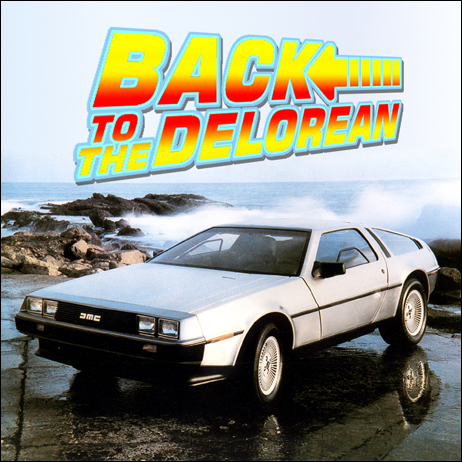 The DeLorean (or, rather, the model officially known as the DMC-12) was built for the US market and set out to pinch sales from the Chevrolet Corvette. It was to be a total performance car - "something economical to run, safe, high quality and comfortable for the price." Furthermore, it had to have a useful life of more than a few years. 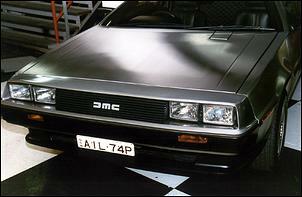 The DeLorean Motor Company (DMC) was founded in 1975 by John Z. DeLorean and the DMC-12 project was made possible thanks to incentives offered to locate the factory in Northern Ireland - Northern Ireland having major unemployment problems at the time. Production commenced in an all-new factory at the beginning of 1981 and ceased at the end of 1982; the DMC-12 remains the only model ever produced by the company. The platform for the DeLorean is a steel backbone chassis, which is sealed in fusion bonded epoxy to protect it from corrosion. Toward the front and rear of the chassis, the steel backbone is split into a wishbone shape to support the respective cross-members and suspension. The front suspension comprises unequal length upper and lower control arms, coil springs, telescopic shocks and a swaybar. Steering is via a rack-and-pinion arrangement providing 2.65 turns lock-to-lock and a 10.67-metre turning circle. At the rear, there are diagonal trailing radius arms with upper and lower links, coils and telescopic shocks. Interestingly - since Lotus was responsible for much of the DMC-12's engineering and development - the frame and suspension is very similar to that of the Lotus Espirit. 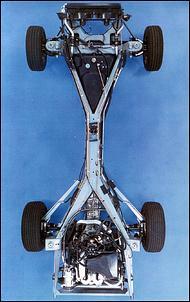 The most extravagant aspect of the car is its outer body construction. 'Food grade' 304-grade stainless steel (which offers excellent corrosion resistance) was used as the skin over an injection moulded fibreglass body structure. Note that the stainless steel outer panels were left completely unpainted and without any form of clear coat, but the surface did receive a brushed finish. 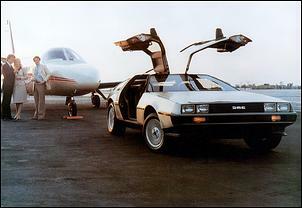 The exterior design of the DeLorean was the work of Italian guru Giugiaro. Look closely and you'll also pick a few styling queues that were taken from the early '80s Lotus Esprit. 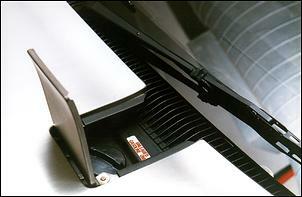 Another standout feature of the DMC-12 are its gull wing doors, which require only 14 inches of side clearance to fully open. These vertically opening doors are a design masterpiece counterbalanced by cryogenically preset torsion bars - the cryogenic treatment reputedly reducing the chance of the bar fatiguing. Open those gull wing doors (which, incidentally, don't make any of the noises they do in the Back to the Future movies!) 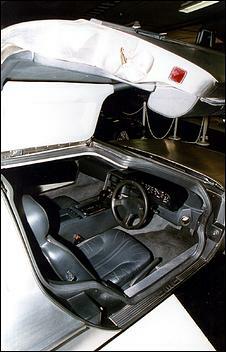 and you can appreciate how comfortable and well equipped the interior is - for a 1981 vehicle. Standard fitment included two fully adjustable leather seats (no rear seats), power windows and mirrors, variable speed wipers, central locking, a tilt/slide steering wheel, climate control, full instrumentation, a high-output AM/FM cassette with digital frequency display and double weather seals around the door apertures. The driving position is very sporty, but - true to the initial concept - it's also very comfortable. 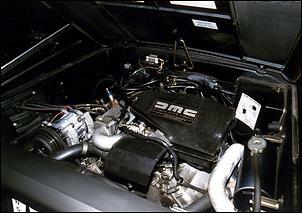 Nestled into the rear of the DeLorean is a longitudinally mounted V6. The so-called PRV6 engine (a joint development between Peugeot, Renault and Volvo) is a SOHC 90-degree 2.85-litre V6 whose basic architecture is based on Volvo's B28F engine. The block and heads are made from alloy, the compression ratio is 8.8:1, fuelling is taken care of by Bosch K-Jetronic mechanical injection and ignition is left to a Bosch breakerless system. Interestingly, cooling is via a forward radiator with twin fans and pipes running back to the engine compartment. Maximum power is listed at 130 horsepower at 5500 rpm. The DeLorean could be purchased with either a 5-speed manual or 3-speed automatic transaxle; both were essentially Renault Alpine units, revised to suit the DeLorean's driveline layout. 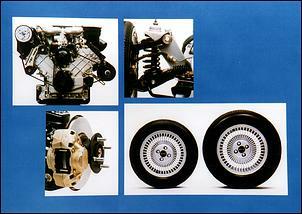 In order to drive the rear wheels, double universal half-shafts were used. Standard wheels are cast alloy - measuring 14 x 6 and the front and 15 x 8 at the rear - wearing factory Goodyear NCT steel radials. The DeLorean's 'RR' chassis layout contributes to a moderate rear weight bias - 65 percent of the overall mass is placed over the rear axle. Overall mass, by the way, is 1233 kilograms (weighed with a full 51.6-litre tank of fuel). As far as we can determine, only 8500 - 9200 of these unique vehicles were produced over its two-year lifespan. Some slight alterations were made to the car during production - early '81 models apparently have a fuel filler flap in the left side of the bonnet, for example (as seen here). There has been a lot of controversy surrounding the relatively early closure of the DMC-12 production plant. Scandal aside though, it appears that the factory folded due to a simple lack of funds - that despite the extravagant prices many DeLorean buyers were prepared to hand over. The 5-speed manual DeLorean had a recommended retail price of US$25,000 during 1981 but, due to huge demand and limited supply, it's claimed some buyers were paying well in excess of the recommended price. Most units were sold to the US market, but a special series was produced for Canada and a few were sold elsewhere. Today, the DeLorean's durable body construction and use of standard European driveline parts make them an ideal restoration project. While it's said that the original panel dies were sold to a fisherman as scrap metal, fortunately a large supply of new DeLorean parts can still be purchased from 'the new' DeLorean Motor Company in Texas. 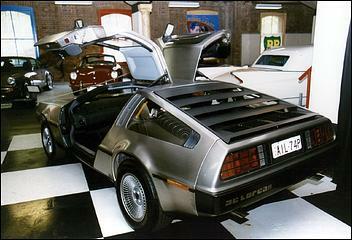 Visit www.delorean.com for details on the company's parts inventory and restoration facility.